CZI Imaging Scientists — engineers, physicists, mathematicians, computer scientists and biologists with expertise in technology development — will help researchers better visualize and analyze microscopy data. Learn about these scientists and what drives them to improve imaging technology, along with some of the medical applications they are exploring. This montage shows a time-lapse of a worm embryo’s neurons assembling into a functioning nervous system. “Recordings and visualizations in simple organisms allow us to see every step of the emergence of a ‘brain’ in a way that is impossible to see in more complicated animals, much less a human.” — Anthony Santella, Memorial Sloan Kettering Cancer Center, Molecular Cytology Core. A forest of nerve cells (axons, dendrites, and dendritic spines of neurons) in the brain. Photo by Gao, Asano, Upadhyayula et al, Science 2019. “I love imaging because every day I get to see something I’ve never seen or imagined. I get to discover for myself the beauty that is the essence of life.” — Srigokul Upadhyayula, University of California, Berkeley (starting spring 2019), Advanced Bioimaging Center. Caroline Magnain images brain structures, focusing on cellular organization, connections and vessels, as well as their disorders. “During my PhD, I used optical imaging to study painting throughout the centuries — for characterization, restoration and conservation purposes. After my PhD, I moved to the biomedical field and accepted a position in neuroimaging. As soon as I had a brain in my hand, I was hooked.” — Caroline Magnain, Massachusetts General Hospital, Athinoula A. Martinos Center for Biomedical Imaging. A mouse brain expresses a fluorescent protein in response to repeated stimuli, and bright regions show cells in areas that were especially active. “This image shows just a single plane out of a whole volume data set of images, illustrating the vast amount of data that can be acquired with modern microscopes.” — Martin Fischer, Duke University, Advanced Light Imaging and Spectroscopy Facility. Super-resolution light microscopy allows scientists to view the details of subcellular organelles — units in cells with specialized functions — in living cells. “As a CZI Imaging Scientist, I have proposed to work on image compression and compressed image acquisition, both of which attempt to store or capture relevant image content using the smallest amount of information possible.” — Aaron Taylor, University of Michigan, BRCF Microscopy Core. 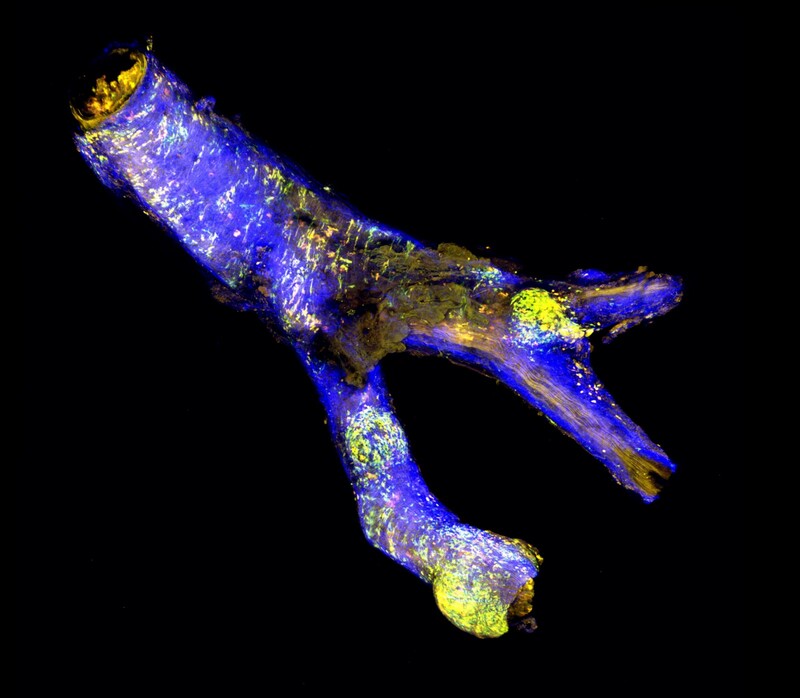 These three images show the cardiovascular system of a living, 4-day-old zebrafish. In the middle image, the vasculature is highlighted in blue, while red blood cells and heart muscle are depicted in red. The fish is about 5mm long and the heart is about 200 micrometers big (akin to a thick human hair). Scientists study animals like zebrafish — a tropical fish sporting horizontal blue stripes — to learn about human diseases. “I love being able to record and study the behavior and function of living organisms under physiological conditions — without harming them, and without them realizing that they’re being observed.” — Michael Weber, Morgridge Institute for Research, in affiliation with the University of Wisconsin-Madison, Flamingo Project. Cvic Innocent uses microscopy equipment. “My favorite part about working in imaging is collaboration between different scientific fields. It’s exciting when an instrument or software was built for one purpose, but after tinkering is able to be used in a whole new way, and this insight comes from working with people from different backgrounds.” — Cvic Innocent, Boston Children’s Hospital, Cellular Imaging Core. A scientist’s view of imaging equipment. “Using modern imaging, it is possible to attach a green fluorescent protein — isolated from the jellyfish Aequorea victoria — to an HIV-1 viral particle and watch as it enters the cell and travels towards the cell nucleus. By measuring the velocity and direction of travel of these particles, and studying how the cell sometimes is able to block them, we hope to develop better therapies to eradicate HIV-1/AIDS and other viral infections that affect the lives of millions worldwide.” — Caterina Strambio-De-Castillia, University of Massachusetts Medical School, Biomedical Imaging Group. This image shows the carotid artery of a mouse with atherosclerosis — one of the underlying causes of heart disease. “The red, yellow and green cells are immune cells that take up cholesterol and help regulate inflammation in the arterial wall (shown in blue, representing collagen). Imaging these cells inside diseased arteries helps us better understand their function and how they affect the progression of atherosclerosis.” — Sara McArdle, La Jolla Institute for Immunology, LJI Microscopy Core. A zebrafish embryo at one day old, imaged in the Tissue Microscopy Laboratory at Texas A&M University. “This is one of my favorite images because you can see the conserved primary brain regions just after they have readied themselves to support the development of the finer structure and wiring of the brain. 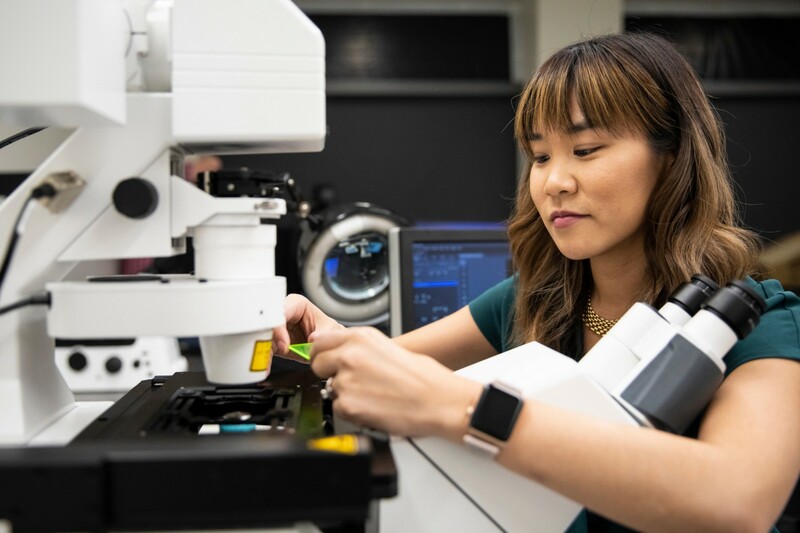 Seeing it motivates me to work on developing tools that will help us understand more of how this fascinating process unfolds.” — Holly Gibbs, Texas A&M University, Microscopy and Imaging Center (starting spring 2019). Scot C. Kuo in the lab. “Although optical and electronic hardware play critical roles for enabling new imaging technologies, it’s the software that often determines the usability of the equipment for biological and biomedical research.” — Scot C. Kuo, PhD, Johns Hopkins University School of Medicine, Microscope Facility. Left: multiplexed images from lung cancer biopsies acquired with the Vectra Polaris imaging system. Right: nuclei segmentation (blue) and biomarker characterization for each cell (colors correspond to identified biomarkers). “Immune profiling represents a promising approach to identify biomarkers that allow patients to be selected in order to increase the efficacy of precision immune therapy. The right-side image was obtained with a fully automated deep learning approach, opening the way to automatic identification of patients responding to immune-based therapy.” — Thierry Pécot, Medical University of South Carolina, Hollings Cancer Center Translational Science Laboratory. A light microscopy image of a 100-nanometer fluorescent bead. “The bead is a sphere, but the bead appears elongated and spread out in the image. This is referred to as the ‘point spread function’ and is a result of the diffraction and interference of light. This image demonstrates how important it is for research scientists to understand the limitations of the imaging instrument they are using, and how to accurately interpret imaging data in spite of these limitations.” — Jennifer Waters, Harvard Medical School, Nikon Imaging Center. CZI Imaging Scientist Douglas Rowland uses a high-resolution MRI scanner, which allows scientists to investigate the anatomy of the brain. “I work with instruments that allow for live animal imaging, similar to how people are scanned in the clinic with MRI, CT or PET scanners. We use these preclinical technologies to understand animal models for human disease.” — Douglas Rowland, University of California Davis, Center for Molecular and Genomic Imaging. These images depict time points from the lattice light-sheet microscope showing a macrophage (a type of white blood cell) internalizing an antibody-coated particle. The fluorescence data is rendered as a volumetric surface to highlight the dynamic motion of the membranes during particle capture. “To develop new therapies for diseases, we must first understand how cells behave normally. We are focused on understanding the inner workings of cells and how they interact with their environment and perform normal functions, with greater mechanistic detail providing the foundational knowledge that will enable future medicines and technologies.” — Brandon Scott, South Dakota School of Mines and Technology, BioSystems Networks & Translational Research. CZI Imaging Scientist Michelle S. Itano at the University of North Carolina, Chapel Hill, Neuroscience Microscopy Core. “The lab I run has high-tech microscopes that use innovative fluorescence microscopy imaging — a special form of light imaging that gives us new ways of looking at biological processes. These images help us answer critical and previously intractable questions in biomedical science by allowing us to see biological processes happening in real time.” — Michelle S. Itano, University of North Carolina, Chapel Hill, Neuroscience Microscopy Core. These nuclear proteins (histones) in a living a roundworm embryo were imaged using the dual-view inverted selective plane illumination microscopy (diSPIM). Maximum intensity projection images are rendered in different colors for visualization. “There are hundreds of thousands of neurons firing in our brains. We can’t investigate the human brain at that scale, but we can use model organisms to see how neurons are firing as the animal behaves. Understanding brain activity is crucial for many reasons, including finding drug targets for neurological diseases and disorders.” — Abhishek Kumar, Marine Biological Laboratory (starting summer 2019), Eugene Bell Center for Regenerative Biology and Tissue Engineering.